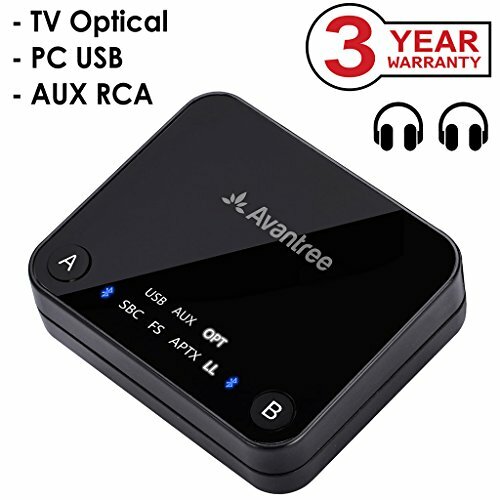 Avantree Audikast, aptX Low Latency wireless transmitter, wirelessly stream audio from your TV/PC to your headphones/speakers. Adopts aptX Low Latency technology, ensuring audio is delivered in sync with visual media, significantly reducing audio lag and ideal for watching TV/movies/videos. It has user friendly interface, you can check connection status just at a glance with the LED indicators. Three audio connection options is supported: optical, analog (3.5mm) and USB audio input (PC / laptop). 100FT / 30M LONG RANGE: Using Class 1 Bluetooth technology and an optimized antenna, the Audikast can reach up to 100ft! NOTE: Operation range can be affected by Wi-Fi routers, Wireless TV adapters etc. and also depends on receiving device. USER-FRIENDLY INTERFACE: Clear status indicators let you know when it’s in pairing mode, when it’s connected and what type of codec is used. Separate buttons make controlling different headphone connections easy and intuitive.